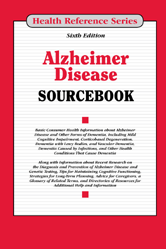 Provides basic consumer health information about symptoms, diagnosis, and treatment of Alzheimer disease and other dementias, along with tips for coping with memory loss and related complications and advice for caregivers. Includes glossary of related terms and directory of resources. Chapter 9—What Happens to the Brain in Alzheimer Disease? Section 18.2—Dementia with Lewy Bodies . Section 19.1—What Is Vascular Dementia? Section 25.3—Diagnostic Guidelines for Alzheimer Disease: Frequently Asked Questions. Section 30.2—Genetic Advances in Alzheimer Disease Research.